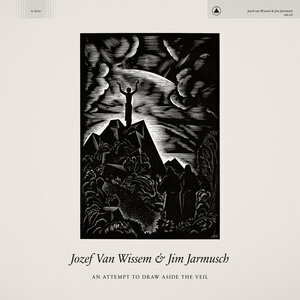 Famed independent film director Jim Jarmusch never really gained notoriety for his musical exploits, and Dutch experimental lute player Jozef Van Wissem isn't exactly a household name, so it may not be a surprise that a musical collaboration between the two artists would fly under the radar. But the truth is, they've worked together frequently over the past few years. Beginning with a chance meeting in New York City in 2006, Jarmusch and Van Wissem have since collaborated on three studio albums (Apokatastasis, Concerning the Entrance into Eternity, and The Mystery of Heaven. Van Wissem also contributed to the soundtrack of Jarmusch's film Only Lovers Left Alive. The collaboration has yielded a new album in 2019, the typically dark and hypnotic An Attempt to Draw Aside the Veil. The album could be seen as a sort of sequel to The Mystery of Heaven in that – like that 2012 album – it explores the theology of William Blake and Emanuel Swedenborg and also touches on the work of Russian occultist and philosopher Helena Blavatsky. But since the album is primarily an instrumental work, a basic knowledge or even an appreciation for these topics isn't really necessary to dig into the music. Like the subjects it approaches, however, it is dark, intense stuff (the typically cryptic and arcane song titles are the best representation of the deep thinkers that serve as the inspiration). With Van Wissem on lute, Jarmusch handles guitar and electronics, and the results are often startling and ominous. The opening track, "Concerning the White Horse", is a droning bed of squalls and distorted chords reminiscent of the experimental metal of Sunn 0))), punctuated by occasional sparse percussion thumps. Things quiet down ever so slightly on "Dark Matter", as the distortion is held (ever so slightly) at bay, giving the song the feel of a mild cool-down period. "The Unclouded Day" is even more of a breather, with Van Wissem's gorgeous lute taking center stage over Jarmusch's noise excursions, to the extent that it may even qualify as gentle folk or new age if it weren't for the dark chord choices. Like most of the album, "The Unclouded Day" has a repetitious, minimalist flavor; it doesn't really go anywhere, but the simplistic, uncomplicated execution feels refreshing. Likewise, "Final Initiation" has the gentle quality of a salve to soothe Jarmusch's noisy tendencies (although they do turn up here, albeit in a more subtle manner). The darkness is kept at bay, but it still lurks under the surface. But for every light touch, there's more crushing noise. The final track, "When the Sun Rises Do You Not See a Round Disc of Fire" is full of long, labored chords peppered with distortion and that same primitive percussion that opened the album. A computerized spoken word sample closes the song, adding another odd, disturbing element to an already murky, mercurial piece of work. An Attempt to Draw Aside the Veil is the work of two accomplished artists fusing their talents to create an oddly beautiful yet startling collection of music. Each artist brings something unique to the collaboration, and it's a combination that's unmistakably arresting.